During the big band era of the 1930’s and 40’s, swing music began to incorporate larger brass sections. This prompted the need for an amplified guitar in order to be heard. 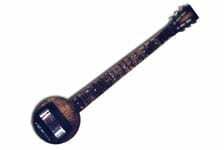 Early attempts at producing a louder instrument came in the form of resonator guitars, which consisted of thin, cone-like aluminum resonators placed inside a metal body. Although these guitars were successful in making the instrument louder, resonator guitar tones simply didn’t compliment a broad variety of music, and therefore did not stand as the long-term solution to volume issues. Resonator guitars would go on to be successful in their own right, most notably in bluegrass and blues music. Engineers experimented with electrically powered instruments such as musical boxes and player pianos as early as the 1800s. However, the first attempts at amplified instruments did not come until the development of electrical amplification in the 1920’s. One of the earliest pioneers was a Gibson engineer named Lloyd Loar. In 1924 he developed an electric pickup for the viola and other stringed instruments. In his design, the strings passed vibrations through the bridge to the magnet and coil, which registered those vibrations and produced an electrical signal. These designs attempted to amplify the natural sound of guitars, but produced a very weak signal. 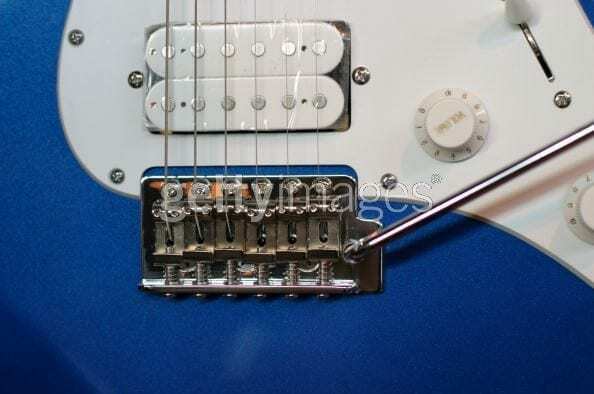 It was not until the invention of a more direct pickup system, which used an electromagnet to register vibrations directly from the strings, that the modern guitar pickup was born. The first commercially produced guitar to use this method was actually a Hawaiian style guitar called the “Frying Pan”, which was developed and marketed by George Beauchamp and Adolph Rickenbacher in 1932. This concept would then be applied to hollow body archtop/semi acoustic guitars. These guitars produce a full and rich tone due to their chambers -but are prone to feedback when played at high volumes. As a result, a fewindividuals (of which Les Paul is probably the most well known) began experimenting with a new kind of electric guitar, which used the same magnetic pickup as earlier designs, but mounted on a solid block of wood. Thus the modern day electric guitar was born as a result of the electromagnetic pickup. WHAT IS A MAGNETIC PICKUP? A pickup is a type of electrical generator based on Faraday’s laws, which states that a varying magnetic field will induce an electrical current into a conductor (such as a metal coil) passing through its field. Magnetic pickups consist of a single magnet (or one for each string) with a coil of wire wrapped around it. When mounted beneath metal guitar strings, the motion of moving strings disrupts the magnetic field, and produces an alternating electrical current within the coil, which can then be sent to an amplifier via a cable. Magnetic pickups can only work with strings made from a ferro-magnetic metal such as: iron, steel cobalt, or nickel. This is because the strings must be capable of disturbing the magnetic field in-order to induce a current in the pickups coil. Magnetic pickups are most commonly associated with the electric guitar, however they are also used in an adapted form to amplify acoustic guitars. The two most common types of magnetic pickup are Single-Coils and Humbucking pickups. Single-coils consist of either a single central magnet, or separate magnets beneath each string. The magnet can be made of magnetised steel or a magnetic alloy – such as: Alnico, Samarium Cobalt, or Neodymium. However, in some designs (usually budget imported guitars) a ceramic magnet is used to energise soft iron pole-pieces placed in contact with it. George Beauchamp produced the first successful single-coil pickup for the frying pan guitar mentioned earlier. The pickup consisted of two “U” shaped magnets with one coil, and was named the “horseshoe pickup” – for obvious reasons. 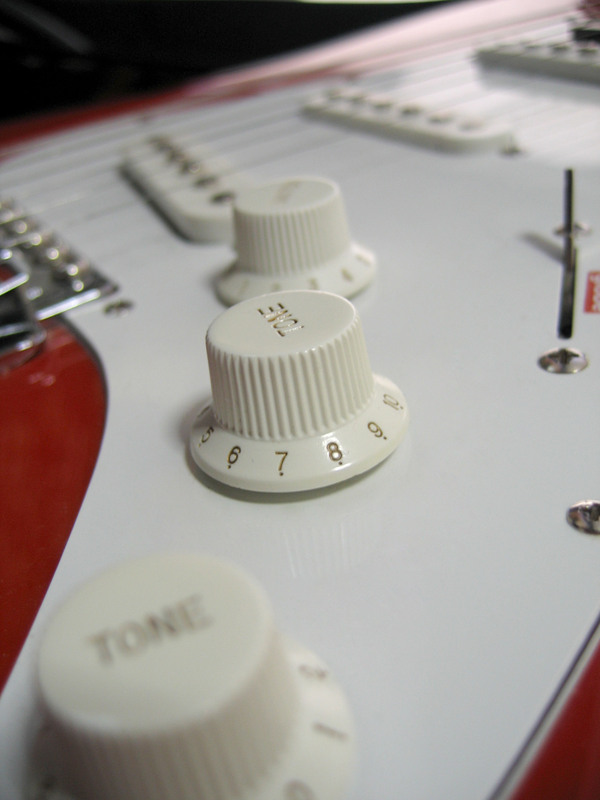 The most common form of single-coil pickups are found on Fender Stratocasters and Telecasters. These designs are a physically narrow pickup with a well-focused magnetic field, which pick up energy from a short section of the string, which results in a more extended high-frequency response than broader pickups. This brings us neatly onto P-90’s, which are the next most common design of single coils. The P-90 is a single-coil pickup introduced by Gibson in 1946. They consist of a large flat coil with adjustable pole pieces for each string, and a pair of flat alnico bar magnets lying underneath the coil. 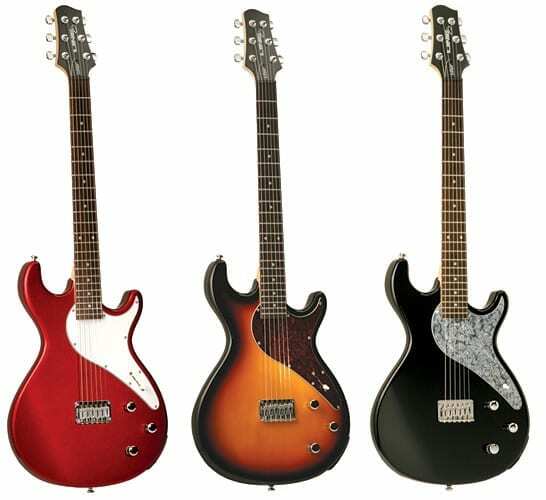 P-90s are somewhat brighter and more transparent than Gibson’s more common hum-bucking design, but are also slightly fatter and warmer than Fenders single-coil pickups. This is due to the wider coil and wider magnetic aperture of the pickup, which results in a less accentuated high frequency response. This is because the relative phase of string harmonics vary with position, and if you pick up sound from a larger area of the string’s length – the higher harmonics will cancel out to some extent. Single-coils tend to produce great clarity and high frequency response, but are susceptible to picking up electromagnetic interference noise known as mains hum, or 50Hz / 60Hz hum. Mains hum comes from sources such as the wiring of a building, power transformers, electric motors, and lighting. Screening can help mitigate the noise, but can only go so far in today’s high tech stage environments. Humbucking pickups on the other hand, which were contrived by Gibson engineer Seth Lover in the 1950’s – cancel out the electromagnetic fields responsible for undesired noise. They consist of a pair of single-coil pickups mounted side by side, with the second magnets polarity reversed, and the coils connected in series. The two coils are connected out of phase, but inverting the magnet in one puts the signal back in phase. As a result, any hum picked up is cancelled out in a similar fashion to a balanced audio cable. The downside was that they didn’t sound the same as traditional single-coils. 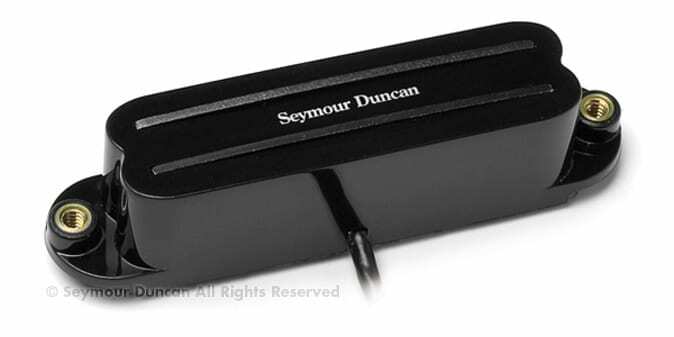 The net result of the humbucker design is a pickup that was punchier and darker than the bright single-coil sound players were used to, and it was no surprise that the more mellow jazz and blues players were the first to adopt the design. In the mid 1960s, as the distorted sound of overdriven valve amplifiers became popular, the humbucker became much more desirable, primarily for its louder output, which would overdrive amplifiers more dramatically than single-coils. The Gibson Les Paul was the first major guitar to use humbuckers, but since then, even some models of the Fender Stratocaster are factory equipped with humbuckers. Strat players often like to have humbuckers installed on their guitar, however, most strats feature cavities the same size as the original single coil pickups, which makes it difficult to do a simple swap without additional routing of the woodwork. One way around this is to build a conventional humbucker with two very slim coils, making what is essentially a single coil sized humbucker capable of being installed without the need to modify. DiMarzio and Seymour Duncan make successful models of this design, and the sound comes very close to what you’d expect from a full-sized humbucker, despite the fact that such pickups have a smaller magnetic aperture than their original counter-parts. The above mentioned designs create a sound close to what you’d expect from a humbucker, with a big mid-range, and a smoother high frequency response than a narrow single-coil pickup. But how do you capture the single-coil sound, and keep the hum-cancellation? One way is to build two pickups with the coils and magnets arranged as in a traditional humbucker, but make the coils smaller, with one sitting beneath the three high strings, and the other beneath the three lower strings. Providing the combined inductance of the two coils is not higher than it would be in a single-coil pickup, it should retain the single coil twang. Another design is the stacked humbucker (first patented in 1972) which had the dimensions of a single-coil. The two coils are stacked vertically on top of one another, and wired out of phase for hum-cancellation. However the designers have to be slightly smarter than this, or the signal would cancel out entirely – due to both coils sitting on the same set of magnetic pole pieces. To rectify this you simply place the lower coil in a weaker magnetic field, so that it makes less contribution to the output, but still cancels the hum. Many companies such as DiMarzio and Kinman manufacture such designs, with results sounding very close to single-coils. Even Fender have developed a ‘noiseless pickup’ (as seen on the Eric Clapton Signature Strat) which is essentially a stacked humbucker. Active pickups require a power source, and usually consist of a lower impedance pickup followed by a preamp section for boosting the signal. As a result, active pickups are capable of producing a much higher output than passive designs, which has made them popular with heavy metal guitarists – because they overdrive the input stage of guitar amplifiers more dramatically than passive designs. By designing the pickup coil to operate at a much lower impedance, and then boosting the signal with a battery powered preamp, it is also possible to extend the frequency range of a pickup, and to reduce its susceptibility to hum and noise without the draw backs of humbuckers. However, many traditional players have come to love the character of passive designs, and would criticise active pickups for this reason. Saying this, there are other benefits to active designs. They can be designed with active tone controls, to provide the player with more scope for tonal tailoring, before the signal reaches the amplifier. Some active designs are based around passive pickups, with active electrics for EQ or overdrive, but most designs are based around specifically designed pickups. 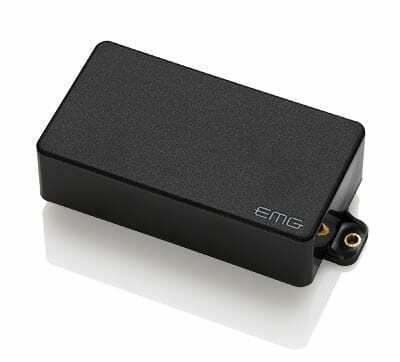 EMG are a well-known manufacturer of active pickups. The obvious disadvantage of active pickups is they require a power source. This can come in the form of an attached battery, or by a special power source fed along the guitar cable. This can be an issue when trying to install active pickups into an existing guitar, as this often requires modifying the body to accompany the battery. Roland pioneered mainstream guitar modeling with their VG8 system, which uses a six-way magnetic pickup that can be attached to your own guitar. Roland later collaborated with Fender to create a Stratocaster guitar, which comes pre installed with the required pickup and electronics required. The Line 6 approach is to build all the electronics into their purpose built guitar, and not sell the system separately. Like the Roland system, the Variax uses a separate pickup for each string, although in this case it’s a bridge-mounted piezo transducer rather than a narrow magnetic pickup. Side note on Piezo Pickups: Piezoelectric pickups are best known as the pickups used to amplify acoustic guitars. Placed underneath the bride, and sensing vibrations coming directly from the strings, they produce a relatively organic tone. Their excellent resistance to feedback, and lack of interference noise compared to magnetic pickups makes them ideal for live amplification. However, they fail to capture the resonance of the acoustic body, resulting in a relatively sterile sound in comparison to acoustics captured by a microphone. Unlike the magnetic pickups, piezos are very good at sensing higher frequencies, making them ideal for acoustic guitars. Because they work with pressure rather than magnetism, they are also well suited to non-magnetic strings, such as bronze or even nylon. In some cases it is popular to blend the signal of a magnetic and piezo pickup. Although there have been modern refinements to magnetic pickups, the basic concept and design has remained the same for many years. In-fact many modern guitar players are still using classic pickups based on designs from the 50’s and 60’s. One example is the 57/62 single-coil pickups from Fender, which are based on the original design from that era. Whether or not you use single-coil or humbucking pickups remains personal preference, and is often dictated by the style of music in question. As a result, most guitarist have a wide range of guitars for different purposes, and although digital guitar modelling has come a long way, most guitar players still prefer the feel and tone of the real designs. Therefore, these guitars remain a niche market aimed at guitar players who are less concerned with traditional tone, and more concerned with reducing the size of their live rig. No doubt the accuracy of these designs will attract more and more players as the technology develops, but for the time being the traditional magnetic pickup remains the electric guitar players first choice.